Smeg’s retro designs are perfect for those who appreciate mid-century modern and contemporary household accessories. In the late 1940s, nestled in the small town of Guastalla, Italy, Vittorio Bertazzoni was hard at work starting his enameling company. 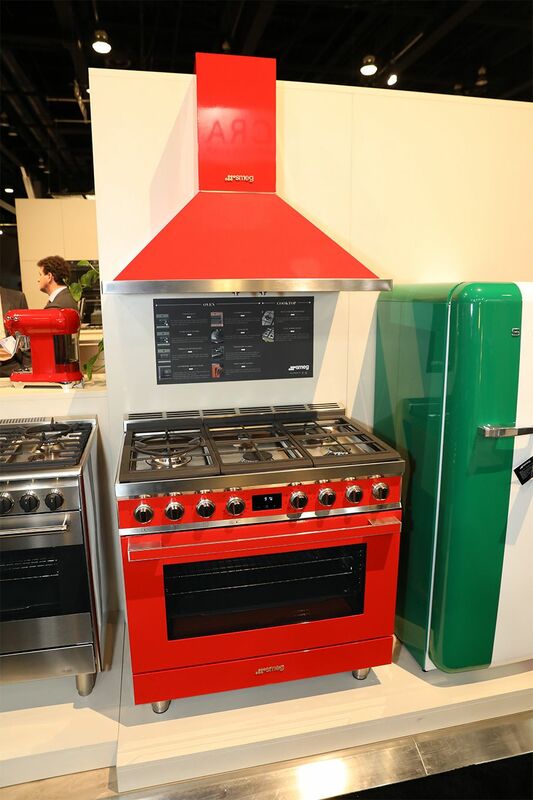 Fast forward 70 years and Smeg (an acronym for “Smalterie Metallurgiche Emiliane Guastalla,” meaning "an enamel factory in Guastalla") is making a name for themselves with their retro take on traditional kitchen appliances. Since bursting onto the North American scene in 2007, Smeg continues to impress consumers in the U.S. and Canada with their 1950s-inspired styles and high-quality materials. Because of their recent successes outside of Europe, Smeg decided to visit the Interior Design Show Vancouver for the first time this year. As luck would have it, we had the opportunity to talk with Sonia Settori, the operations manager. Sonia was a great resource on all things Smeg, from their well-known toasters to newer collaborations with high-end fashion designers. If you’re a fan of mid-century modern, retro and contemporary designs, you’re bound to fall head over heels for Smeg appliances. Metal enamel was the basis for the Smeg company, so it’s no wonder that they continue to feature products with high-quality shiny enamel. But underneath the numerous, unique enamel hues lies some of the most innovative appliance designs available across the globe today. Once a design meets these specifications, it’s ready to be added to their vast collection of large and small domestic appliances. 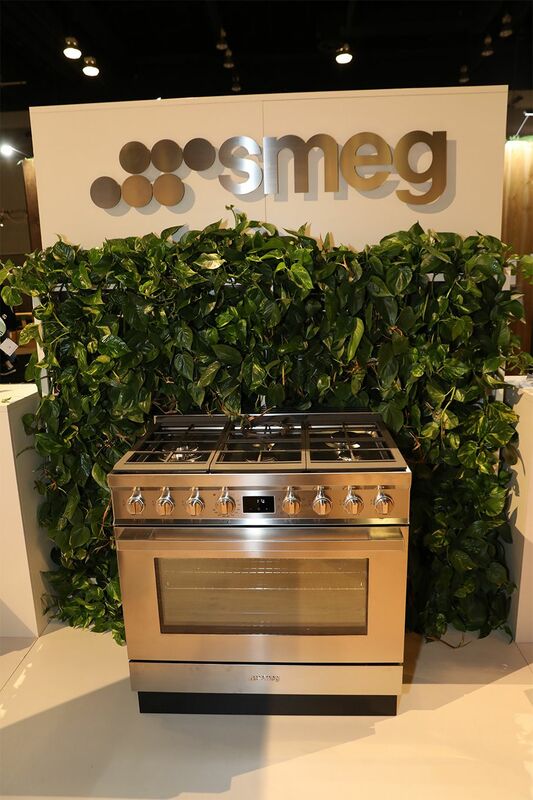 Some of Smeg’s most popular products include ovens, cooktops, ranges, coffee machines, refrigerators, toasters, and kettles. Smeg isn’t just creating amazing products, they’re also continuously collaborating with the world’s top fashion designs, architects, and artists to create premier upscale pieces of art. At IDS Vancouver, Smeg impressed the crowds with their amazing and intricate special edition refrigerators made in collaboration with the fashion designers Dolce & Gabbana. “Although all of these fridges are built by Smeg, each design was hand-painted by an artist from Southern Italy selected by Dolce & Gabbana,” said Sonia. 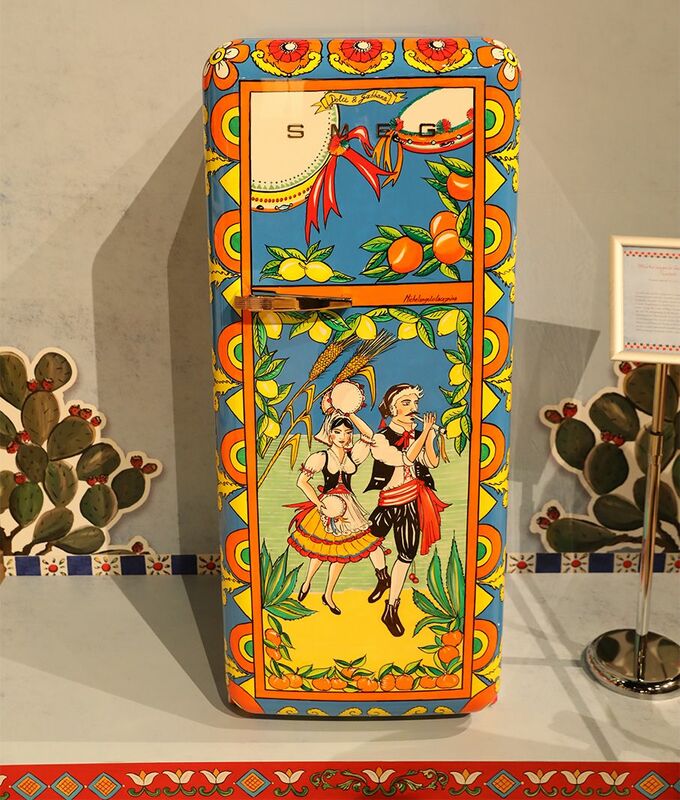 Every specific fridge design is meant to reproduce stories based on traditional Sicilian artwork. The North American market is fortunate to receive 15 unique and intricate fridges that will be distributed through both Smeg and Neiman Marcus. At around $50,000 each, they’re definitely meant for the top end of the market. 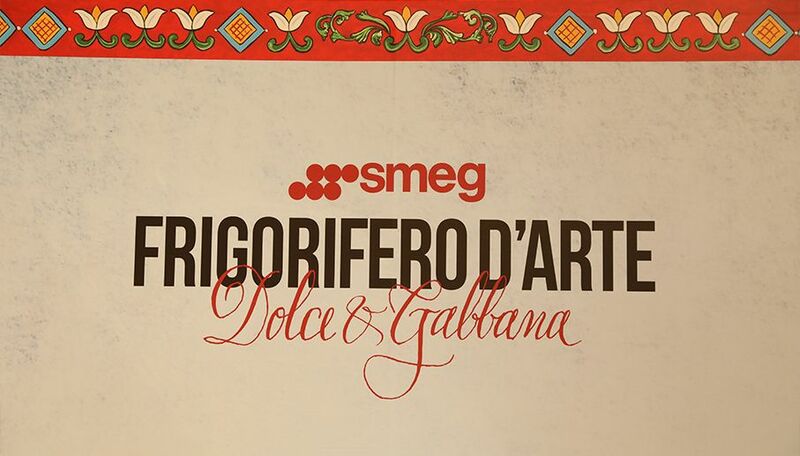 In addition to Dolce & Gabbana, Smeg has partnered with renowned architects Guido Canali, Mario Bellini, and the Plano Design Studio. Stay tuned for more collaborations in 2018! As mentioned before, aside from elaborate fridges, Smeg also makes an assortment of cooking products and small appliances, including toasters and coffee machines. Each one combines the clean look of contemporary home goods with retro-inspired style. A few years back, we discovered Smeg’s amazing product line, including their famous toaster. We saw this product as the epitome of the blending of form and function, so we made sure to incorporate it into a number of our virtual rooms. If you get a chance, play around with them to visualize how you can use Smeg appliances in your own home. If you’re eager to have one high-end kitchen appliance in your home, Smeg is the way to go. You’ll wind up with a beautiful appliance that’s both functional and statement-worthy.